If you’re looking for a decent office chair that has plenty of cushioning and adjustment options, then this model may be for you. The Basyx by HON HVL210 Desk Chair for Office or Computer Desk Review looks at the various features and benefits of this chair so that you can make your own decision about whether or not this is a product that will work well for you. Double layered cushions on the backrest and the seat of this office chair ensure that you can be comfortable whilst using it. 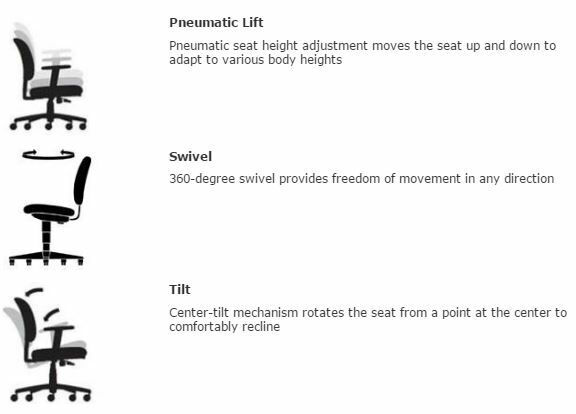 Pneumatic lift feature allows you to easily adjust the height of the office chair with a lever. The height adjustment is smooth and means that this chair can be used with different heights of desks and for people who are different sizes. 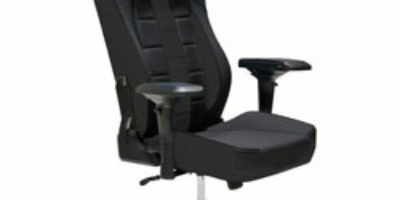 You can control the center tilt tension and use the tilt lock with ease with this office chair. 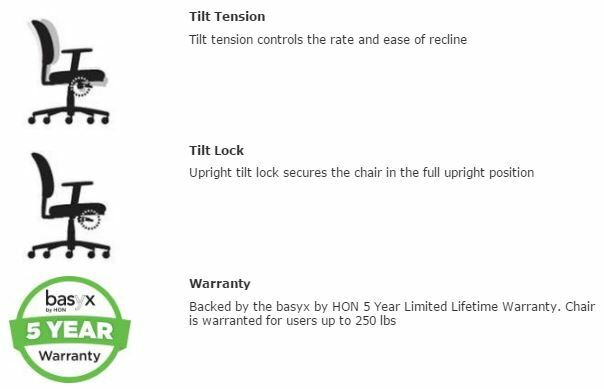 The tilt tension determines how smoothly and how much resistance there is with the reclining feature of this office chair. Being able to add more tension means that you can use the free tilt feature without feeling unstable whilst sitting in the chair. The tilt lock feature allows you to lock the office chair into a tilted position. This means that you don’t have to try to keep the chair balanced in a tilt position yourself and this feature helps those who feel unsteady in an office chair that has a free tilt. So that you can maneuver around the office without difficulty, you can use the swivel feature. This provides 360-degree rotation so that you can move in any direction. This reclining office chair comes with an impressive 5-year warranty. This ensures that the office chair will be protected against any faults or defects for 5 years, which is better than most other manufacturers offer. Although this office chair is lightweight, it still has a double-layered cushion to the back and seat. This ensures that you can enjoy comfort and support whilst being able to move the chair around the office if you need to. Useful features like the swivel feature and tilting allow you to comfortably move in the office chair without feeling restricted. The comfortable back support allows you to feel less pain than you may have experienced when using office chairs in the past. This office chair is easy to assemble, which means you can reduce the time it takes you to set it up, giving you more time to get on with your work. The adjustments are easy to make to it too including the pneumatic lift feature. This office chair is suitable for anyone who wants a lightweight chair that provides some comfortable and flexible features. It is one of the best office chairs to purchase for all users in an office environment, as there are not as many customization options as there are with others. This means that users don’t have to spend time readjusting the chair if someone has altered it to meet their own measurements. High-quality materials ensure good durability. A long 5-year warranty protects your office chair against problems in the first few years. 360-degree swivel feature allows you to move around easily in the office. Double layered cushions give you support and comfort. Tilt feature allows you to recline for comfort and the tension control means that you can alter the stability of the tilt. You can set one of the tilt locking positions so that the office chair can remain reclined. Pneumatic lift allows the height to be adjusted with ease. 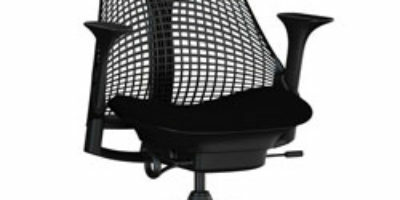 Some users complain that the mesh backrest is of lower quality and does not feel like it offers safe support. The lack of a headrest means that your head and neck are not supported whilst using this office chair. Learn how to easily adjust your office chair! 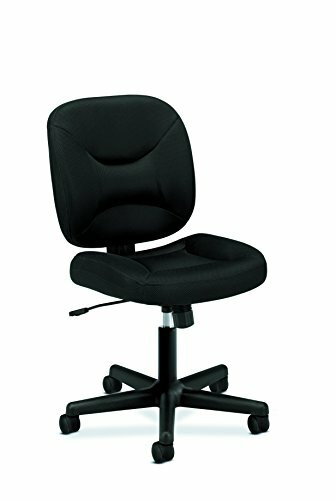 This Basyx by HON HVL210 Task Chair for Office or Computer Desk Review is a useful resource for finding out the various benefits and drawbacks of this office chair. Whilst it is slightly basic by not having a headrest or complete lumbar support, it does have a more minimal style that is suited to smaller offices. It is also lightweight and can be moved around the office with ease. There are plenty of useful features that it does offer including tilting reclining features and double layered cushions for comfort.